Do you need extra help for EL students? Try the Elements of Fairy Tales pre-lesson. Students will be able to identify the elements of a fictional text. Begin this lesson by having the following headings written on the dry erase board: title, author, characters, setting, problem, and solution. Alternatively, project the Fairy Tale Organizer onto the wall or whiteboard. Review the definitions of the terms written or projected in the classroom. Tell your students they are going to use their knowledge of story elements to create classroom posters. Remind the class that story elements are the fundamental parts of a story. 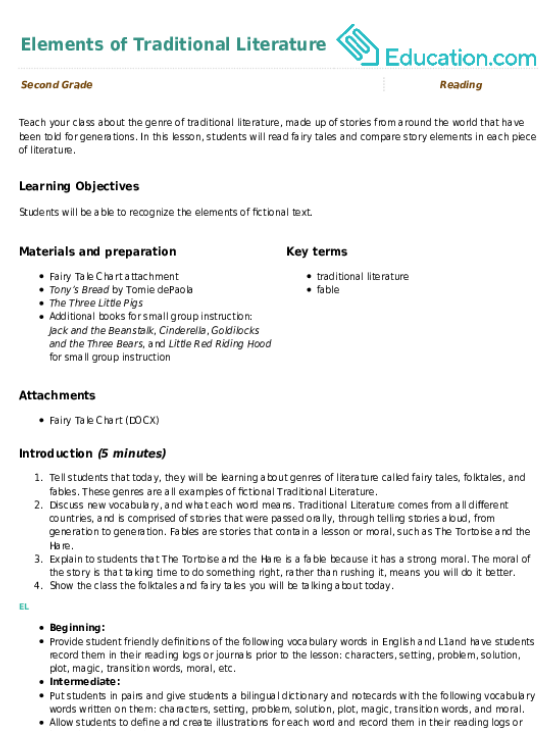 For example, the setting is where the story takes place. Ask the students to think about the story elements of a common fairy tale, such as Cinderella. 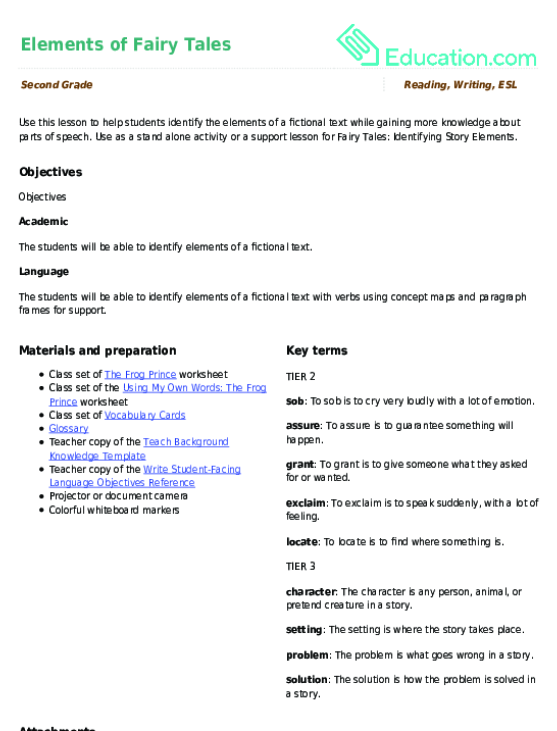 Define the story elements in English and student's home language (L1) prior to the lesson. Read Cinderella with ELs prior to the lesson, explicitly referring to the story elements. Provide students with a word bank with story elements and connecting visuals to refer to throughout the lesson. Using the dry erase board, or projected organizer, ask students to recall the story elements from Cinderella. Call on volunteers until all of the elements have been identified and written on board or typed into projected organizer. Pass out the copies of the Fairy Tale Organizer. Arrange students into groups or pairs. Explain to your students that they will be reading a fairy tale of their choice in their group (or pair). Encourage students to use the Famous Fairy Tales worksheet set to choose a story. Have each pair or group of students read the title and briefly summarize each story. Organize a plan to have students select and collect the fairy tale they want to read in their group or pair. Provide a simplified text a set of visual vocabulary cards of important words from the story. Select a fairy tale for the student prior to the lesson and provide student with a word bank with important terms and phrases to provide support as they are reading. 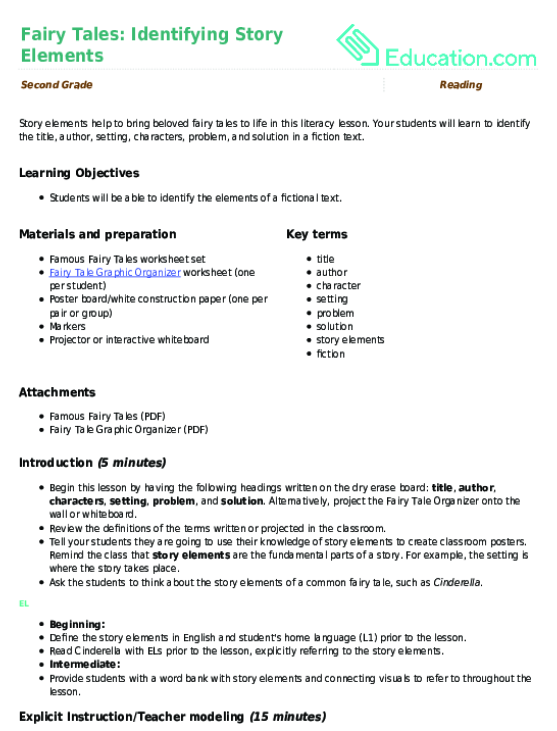 Make sure each student has a copy of the Fairy Tale Organizer and a fairy tale in their groups or pairs. Instruct students to take turns reading the fairy tale aloud in their group or pair. Before the students start reading, explain that they will fill out the Fairy Tale Organizer once they have completely finished reading their chosen fairy tale. Walk around the room and monitor groups as they are reading to ensure that each student is taking a turn at reading aloud. 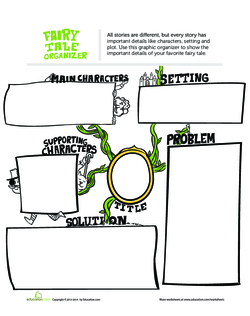 As your students finish reading, monitor the groups as they complete the Fairy Tale Organizer. Once all of your students have completed the Fairy Tale Organizer, direct their attention back to you. Explain to the class that they will be creating a poster displaying the story elements that they identified in their organizer as a group or pair. To help your students better understand each story element, consider having a model Fairy Tale Organizer created ahead of time for the fairy tale used to introduce this lesson. Allow student to read story in a teacher-led small group. 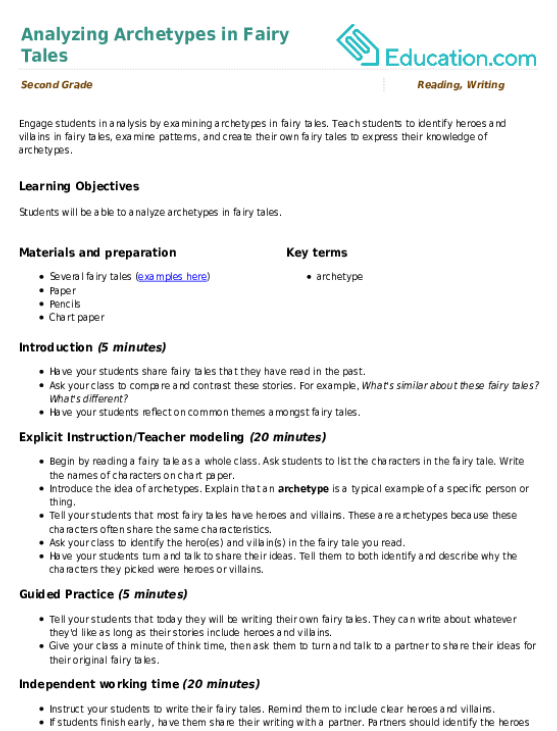 Provide student with a partially filled out graphic organizer and have student finish the graphic organizer with support from the teacher and peers. Pair student with a sympathetic non-EL student. One of the characters in the story is ____. I know this because ____. I believe the setting of the story is ____. I know this because ____. The problem of the story was ____ and it was solved because ____. Explain to the students that all the information on the organizer must be represented on the poster in some way. Encourage students to use drawings and bright colors to create their poster. Have your students use pencils to sketch out their poster elements. Approve each student's sketch before he colors it in. Monitor your students as they create their posters. Allow students to create posters in a small, teacher-led support group. 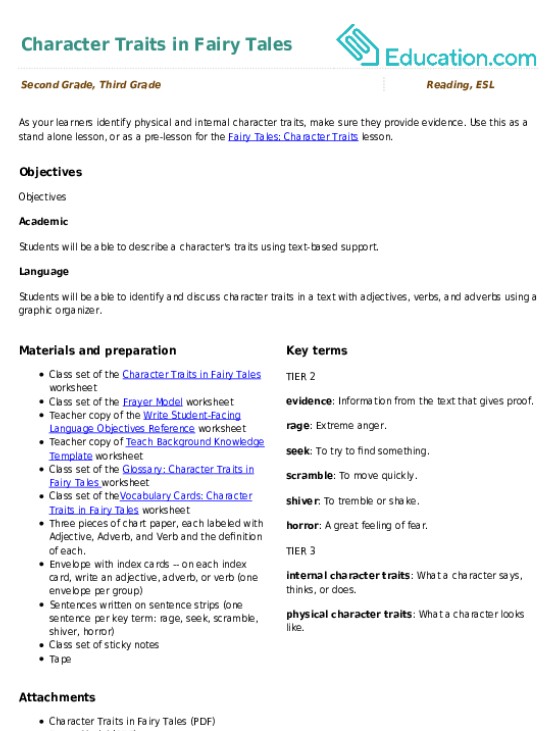 Allow students to work with partners to create posters. Encourage students to refer to their word bank with terms and phrases as needed. Enrichment: Ask students who need a greater challenge to complete the Fairy Tale Organizer for an additional story. Support: Arrange students who need support into a small group to complete the Fairy Tale Organizer together. Ask each student to make their own poster. Assess your students' understanding of story elements by reviewing their completed posters. For a more formal assessment, have your students identify all of the story elements after independently reading their chosen fairy tales. Have student read the information on the poster orally to a peer or teacher. The title of the story I was read was ____. The main characters are ____. The supporting characters are ____. I chose to draw ____ because ____. My drawing of ____ shows the story element ____because __. Wrap up the lesson by asking your class to recall and identify the story elements of any fiction, or make-believe, text. Reference the posters after reading stories as a class. This will help strengthen your students' understanding of the parts of a story. Who was one of the characters in the story? Encourage students to use their word banks as they recall the elements of a story as a whole group. My favorite story element to draw was ____ because ____. If I could change the beginning or ending of the story, I would choose to change the ____because ____. Another interesting setting for the story would be ____ because _____. 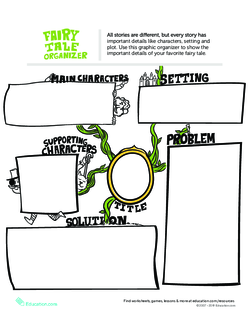 Use as a stand alone activity or a support lesson for Fairy Tales: Identifying Story Elements. Engage students in analysis by examining archetypes in fairy tales.